The UV Flatbed HQ2513 is an innovative printer with technology that makes possible a high-quality printing in all kind of materials. The UV flatbed unique Industrial design guarantees stability for an outstanding quality printing on irregular shapes and uneven surfaces. Its advanced controlling and driving system improves speed and productivity, and the automatic media loading and printing system ensures precise drop placement, accuracy in registration and superior print quality. 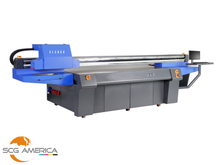 The specialized applications of the UV Flatbed allow the user to expand new business opportunities, from personalized items, backgrounds, sliding doors, glass, signs, posters, smartphone covers, to prototyping and packing. The UV Flatbed HQ2513 is the ideal solution for complex industrial or commercial printing where accuracy and consistency are crucial. that does not break your bank.